Backup, sync, restore and clone your Windows system, crucial data, and necessary applications with the simplest backup service provider. Complete and straightforward Windows backup software, sync, restore, and cloning software for Windows 10, 8.1, 8, 7, Vista, XP desktops, laptops, and workstations. Reliable server backup program to ensure business continuity and effortless recover systems and data to minimize server downtime with different solutions. Designed for companies with multiple computers and consultants who provide charged billable technical services, includes unlimited usage. All-in-one data protection and disaster recovery solution for PCs and Laptops. Automatic, full, incremental, and differential backups simplify your backup tasks. Real-time file and folder syncing from source to target paths without delay. Clone HDD to SSD, HDD to HDD, or SSD to SSD for disk upgrades and data migration. Create a WinPE or Linux bootable drive for bare bones or unbootable computers. Support Windows 10, Windows 8.1/8, Windows 7, Vista, and XP (all editions, 32/64-bit). Thanks to your software. I used it to clone my 750 G drive to a 500 G hybrid drive. I put the hybrid drive in my computer, and it did perfectly. I'd like to use it as my backup software for Windows 10 in the future. Thanks again. I wish to inform you that AOMEI Backupper is the best backup software I have used. Previously had to restore Win8 to factory default, do all the updates, etc., then install Win8.1. Huge amount of data wasted. I installed Win AIK, then created a USB boot device and did a back up to partition, and it worked perfectly. I took the risk and clicked restore. In no time was restored to perfection. Thank you so much for this free backup software. AOMEI Backupper Standard (formerly known as AOMEI Data Backupper) is a simple tool for backing up files, partitions, hard drives or your system. The program's straightforward interface will be immediately familiar if you've ever used another backup tool. 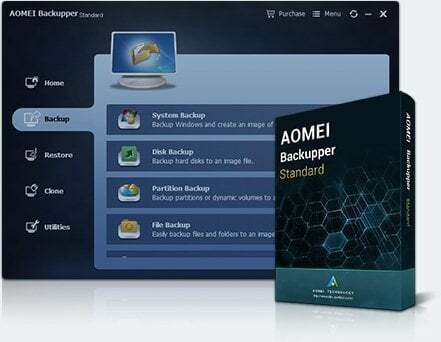 AOMEI Backupper Professional is one of the utilities that can come in handy for creating backups of your most important data.